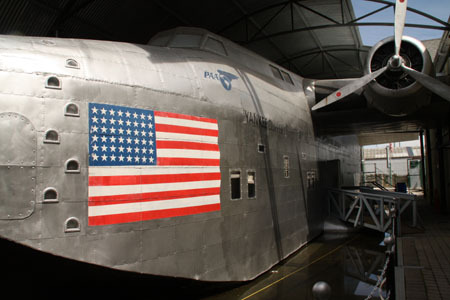 If you visit the Ring of Kerry and Dingle Peninsula in southern Ireland–probably the most popular tourist destinations in that country—be sure to stop at the Foynes Flying Boat Museum in County Limerick. Here you’ll learn about the nostalgic era when Foynes was the center of the aviation world, from 1939 to 1945. 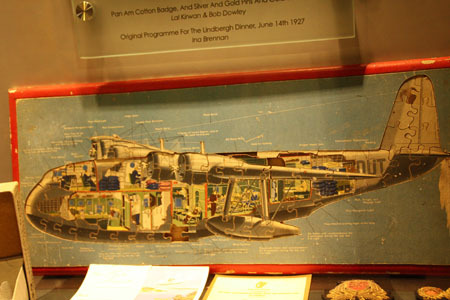 Housed in the original terminal building, the Foynes Flying Boat Museum opened in 1989 and features the only full scale replica of a Boeing B314 in world. The small town of Foynes was an important sea port since 1846 because of its sheltered natural harbor 30 miles from the Atlantic Ocean and 24 miles from Limerick City. Early in World War II, as aviation became an important strategy, the quiet town on the Shannon River estuary was transformed into a major international air base. After Charles Lindberg landed the first solo non-stop trans-Atlantic flight in 1927, there was hope for establishing commercial flights across the treacherous ocean (planes didn’t have instruments in those days; courageous pilots navigated by sight). In 1933 Pan Am asked Lindberg to recommend the best routes. 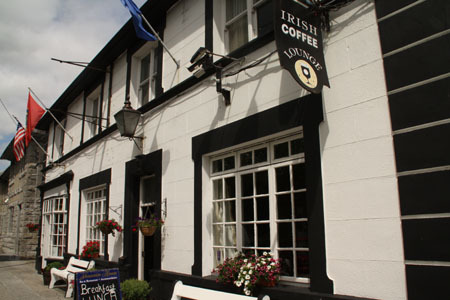 He chose the coast of Ireland as a destination point, landing on the River Shannon, the longest river in Ireland, Scotland, Wales, and England—a feat that was accomplished in spring of 1937. Eight more round trips during the summer of 1937 proved this was a feasible operation, although there were still problems carrying enough fuel, and numerous options were tried including a double-decker plane similar to a rocket booster that separated after the main plane was aloft. That was unsuitable for passenger travel and only carried mail. Eventually, an American plane flew east from Newfoundland, while a British plane took off westward from Foynes; they crossed mid-Atlantic, so neither could claim the first commercial flight. During the peak time, Foynes was the stepping stone between Europe and North America and supported 35 flights a week. Celebrities, Kings and Queens, and politicians passed through Foynes. Because there was no land-based runway, planes landed on the River Shannon and became known as “flying boats.” It was a very labor intensive operation because a pathway of flares had to be set on the water to guide the flying boats on landing. Local farmers were hired to ride into the villages and blow a bugle to signal when a flying boat was due in, so the flares could be set in time. The last scheduled flight from the Shannon River took off in October 1945, ending the flying boat era, although chartered flights continued till 1949. The full scale Boeing B314 on display, which visitors can walk through, boasts a 14-seat blue dining room from which freshly prepared seven-course meals were served to passengers—true luxury, indeed. Each pampered passenger had a regular bed, and their shoes were polished by stewards as they slept. Flight tickets during the war years cost $5000 one-way, and the flight lasted 16-18 hours, so only the wealthy–and adventurous–dared fly the route.